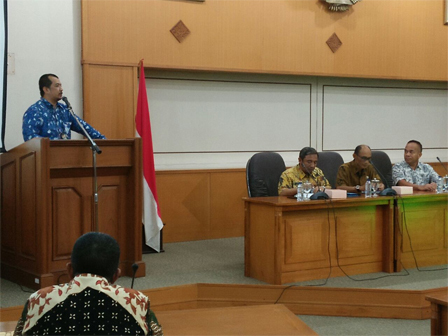 East Jakarta will submit Jakarta Provincial Government asset database which is still managed by third party. All data will be submitted to Corruption Eradication Commission (KPK) for the solution.
" We will optimally prepare asset database as requested by KPK"
East Jakarta Mayor, Bambang Musyawardana said, data submission is done as directed by KPK when KPK conducted work visit and supervise corruption prevention to mayor office on Thursday (3/15). Submitted data will be traced and handled together. "We will optimally prepare asset database as requested by KPK. We will report 256 land plots in total. All of those data are also BPK findings as well," he informed, Friday (3/16). From that findings, actually his side has called parties who controlled Jakarta Government assets for three times. Even his side finds out that one of the assets has been managed by third party since 1971. Meanwhile, KPK Natural Resources Corruption Eradication Team Leader, Dian Patria said, together with East Jakarta Government, her side will fix governance system, data collection prevention, and others. Including government assets that are still controlled by third parties to be handled quickly. "So, we ask for its database first to know how many lands are taken by third parties. That data should be detailed that mentioned about its location, wide, land documents, and others. From that information, we can analyze and know where to start handle it," she added. Her side will coordinate with National Land Agency (BPN). But this step only could be done for land that is still controlled by third party and has not been processed legally.